What’s an artist residency anyway? Usually it’s when an artist goes to live and work somewhere new for a set period of time. They may do it to make work, get inspiration, focus and generally reactivate their senses. How could this practice relate to everyone? It has always struck me that a big element of doing an artist’s residence is the change in perspective you experience when you are in this new environment. When suddenly everything becomes again more interesting and you start to notice and appreciate things anew about the everyday, becoming fully present in your own life. This is the classic holiday feeling most of us all know so well. As we are all creative beings we also need opportunities and techniques such as this to stimulate us in a similar way that an artist might require so we can become better and more effective at what we do. Can this be done without travelling? I believe it can with some effort, practice and willingness on our part because it’s essentially about a change in how we choose to view reality. It’s about going into a residency state of mind. This is just a suggested time. You could try it for a few seconds at first and build up to a minute. If you like the feeling you can stay in that place for as long as you want or return at anytime in the same manner. Why the need for this project? I believe it’s useful for people to be able to put a name on what they are doing, it may help them give permission or a context to practice it. We are all artists in our own ways and can always do with changing and adapting our modes of thought and actions. I believe this is a very simple way to do this which we can all share. I think it has the potential to help change the intellectual and emotional lives of people and how they see the world and maybe even how the world is. Boredom is really freedom we don’t recognise. Anywhere but to begin it may be easier to do it in an unusual and interesting place but once you get the hang of it the whole point is to practice it in your everyday life. In theory, once mastered, you should find the more familiar and unpromising the place and circumstances the better and the more beneficial for you the practice will be. For whom is this project for? It’s for whoever needs to become stimulated artistically by using this model. Some people get this already from their children, type of job they do or through their friends but even for some of these and others they need some extra triggers from time to time. I believe that this could provide a way to see the infinite potential in the everything and nothing again. Although it’s still another subjective experience which may never ring true for everyone. Whatever you like, it’s only limited to your imagination, but try to remain open to whatever can happen in the moment and try to be in a reasonably free position that you are able to follow whatever occurs in it. Improvising and following your heart is always good but also try to slow down, focus, think and look and listen more closer than before. Try having a more objective awareness of the moment you are in. Practice doing it. It doesn’t need to have a tangible outcome. If it works for you please tell your friends about this idea and share this link. 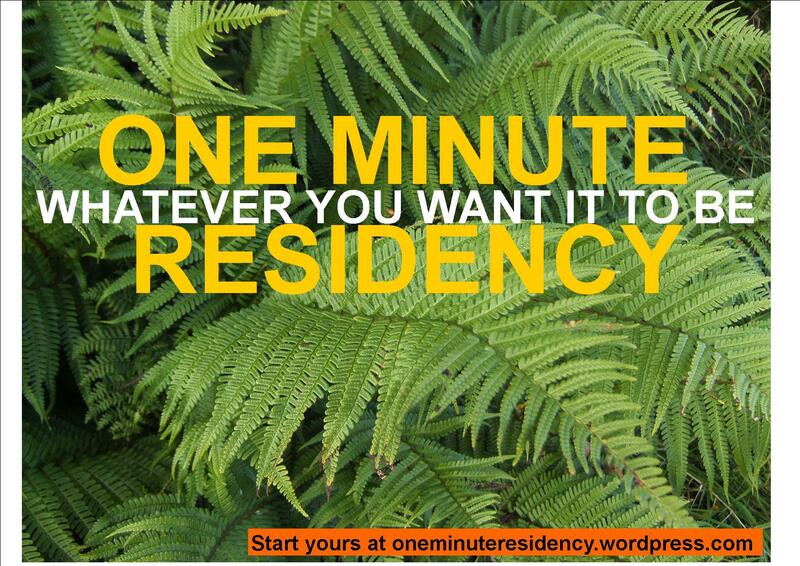 Perhaps leave a message on the Your Comments page about your experience or if you want to share what you did on your own One Minute Residency you could detail it on the Your Residency page. Enjoy it.